Plan your perfect stay with the help of our sample itineraries! 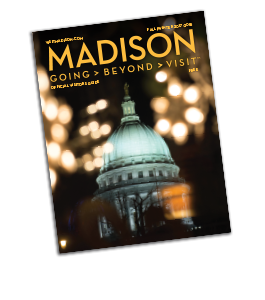 More than 14 million visitors make a trip to Madison each year because of our amazing amenities including five sparkling lakes, to-die-for dining, vibrant downtown and neighborhood shopping districts, and more! A sampling of itinerary ideas below will help you plan your perfect golf getaway. Then check out our accommodations and restaurants pages to complete your stay. NEW! Eating Mobile in Madison: Sample the area&apos;s food carts. Biking Around Madison: Tool around our award-winning trails. Kid Friendly: Uncover many free attractions for the young and the young at heart. Tourist at Heart: Create a checklist of Madison&apos;s best experiences. Like a Local: Get the inside scoop on local hot spots. Exploring the Area: Go beyond Madison and discover Dane County. University Highlights: Tour the University of Wisconsin&apos;s beautiful campus. Romantic Escape: Surprise your sweetie with a Madison getaway. Dairy Discovery: Learn more about America&apos;s dairyland. Wisconsin Culinary Experience: Enjoy classic comfort food and farm-to-table fare. Fantastic Fish Fry: Consume an all-you-can-read page of the best fish fry eateries. Neat Neighborhoods: Play, stay and shop in Madison&apos;s quintessential neighborhoods. Shopping Experience: Get your shopping fix, from specialty stores to major malls. Arts and Music Lovers: Learn where to go to enjoy a play or a live show. Discover Mr. Wright: Tour Madison-area native Frank Lloyd Wright&apos;s architecture. History & Heritage: Visit sites from throughout our capitol city history. Exploring Madison Museums: Observe what&apos;s on display at museums around town.